Redskins owner Daniel Snyder is at the center of a controversy over the team’s name. There is a line between tradition and exploitation, between personal offense and institutionalized insensitivity, between capitulating to political correctness and doing what’s right. The Washington Redskins and their obstinate owner, Daniel Snyder, are on the wrong side of that line. What’s in a name? If you’re the Redskins it’s a stubborn disregard for the feelings of Native Americans who find it demeaning and offensive and an irrational fear of losing your NFL identity. On Monday the Patriots began three days of joint practices with the Redskins in Richmond. 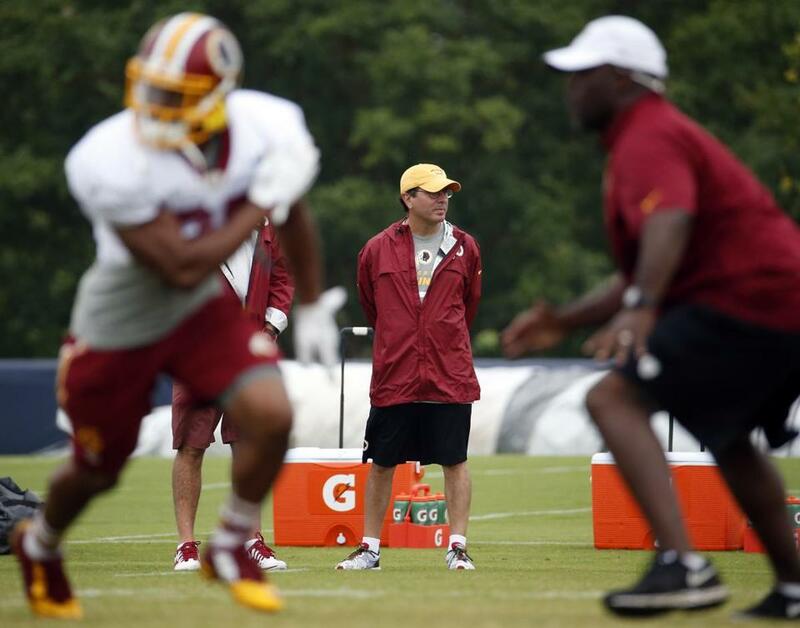 They will open the preseason against Washington Thursday at FedEx Field. The appellation will be in place. It should be gone fast like Redskins Hall of Fame cornerback Darrell Green on an interception return. Changing the name of Washington’s football team is a controversial and complex issue, rife with historical, cultural, and etymological disagreements. Whether the roots of the word have to do with the color of Native Americans’ skin or the macabre peddling of human scalps is irrelevant. Either way it’s anachronistically racist. If you want an eloquent explanation of why the term is so offensive, read the excellent Esquire essay by Globe writer Baxter Holmes, who is of Cherokee and Choctaw descent. Admittedly, altering a football team’s name is not going to rectify or erase the history of abhorrent treatment of Native Americans in this country. But keeping it is just one more indignity aimed at a people who have suffered far too many from folks in Washington. There is a groundswell of support to eliminate the name. President Obama said last October that the Redskins should change their name. In June, the US Patent and Trademark office canceled the Redskins’ trademark registration, saying the team’s name and logo were disparaging. That same month former Redskins cornerback Champ Bailey told USA Today that the name was degrading and said it was “almost like the N-word for a black person.” Last month, US Attorney General Eric Holder called Redskins an “offensive name” and said changing it was obviously right. But Snyder said in 2013 that he will never — sorry, he said to use capital letters, NEVER — change the name. It’s not surprising that Snyder is wrong about the name. He’s been wrong about most things involved with owning an NFL team since he purchased the Redskins in 1999. In Snyder’s 15 seasons as owner, the team has never won more than 10 regular-season games, has made the playoffs four times, and won two playoff games. His defense of the name is the staunchest defense Washington has played in a few years. The irony of those like Snyder fighting so hard to keep the club’s name is that it’s not even the original name of the franchise. The franchise was born in Boston in 1932 as the Boston Braves, playing at Braves Field, then the home of the major league baseball Braves, who now reside in Atlanta. The stadium was on the site of what is Boston University’s Nickerson Field. Imperious owner and inveterate showman George Preston Marshall changed the team’s name to Redskins in 1933, when his franchise became a tenant of Boston’s other baseball team, the Red Sox, moving to Fenway Park. The team moved to Washington in 1937 and won the NFL Championship with rookie quarterback Slingin’ Sammy Baugh. While the name should be changed, I’m not completely insensitive to how Redskins fans feel about it. The deepest emotional connection I have to a sports team is the Florida State University college football team. Their nickname is the Seminoles. My fandom dates back to an instant infatuation with one Deion Sanders. Since 2005, the NCAA has banned Native American nicknames. Florida State got an exemption because it negotiated an agreement with the Seminole Tribe of Florida’s Tribal Council to continue using it. The agreement includes aid for schools on the tribe’s reservation and full scholarships for tribal members who attend Florida State. Still, it’s cringe-worthy when before each FSU game, a student dressed as the Seminole warrior Osceola rides out on a white horse, Renegade, and plants a flaming spear into the field. It’s obvious why many Native Americans would find this ritual and the famed (defaming?) Tomahawk Chop chant highly offensive. An article in The Nation the day after Florida State won its third national title pointed out that the majority of Seminole tribe members live in Oklahoma and oppose the use of the name. If the Seminoles name is deemed offensive, I wouldn’t fight changing it. Florida State by another name still would be my team. However, the mere use of any Native American name is not a blanket act of racism. Redskins is an inherently racist, disparaging sobriquet. However, Chiefs and Braves are names that are synonymous with strength, nobility, and courage, as long as they’re handled with care and cultural respect. The opposite of that care is the Cleveland Indians, possessors of the most outwardly offensive logo in professional sports, Chief Wahoo — a smiling, degrading caricature that is the Native American sports logo equivalent of a minstrel show. The Indians have phased out the logo, but not abandoned it completely. There is a line of PC overload. Do Greeks take offense to the Michigan State Spartans? Do those of Irish descent resent the stereotypical representations of their culture showcased by Notre Dame or the Celtics? But Redskins crosses any line and then spikes the ball in your face. Sacrificing a second-choice NFL team name is a small price to pay for upholding the dignity of a people. Christopher L. Gasper is a Globe columnist and the host of Boston Sports Live. He can be reached at cgasper@globe.com. Follow him on Twitter @cgasper.